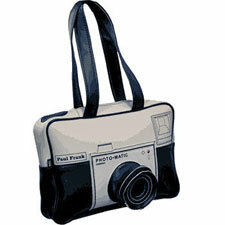 No – this isn’t a bag for your camera, it’s a typically quirky bag shaped like a vintage camera by Paul Frank – known as the Herb Boutique shoulder bag. It’s part of the Paul Frank Boutique collection of shoulder bags. The bag is in black and white, with a main zip to keep your items safe, along with a smaller pouch pocket (the lens), again with zip fastening. And the whole bag is made from Naugahyde – Paul Frank’s leather substitute material, so you’re safe in the knowledge that no animals were harmed in the making of your novelty bag. You can pick it up now from Urban Industry, priced at £70.